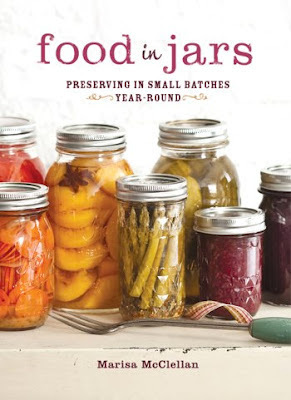 Over at Lucindaville we posted photos of the new Canning Jar Closet and what better accompaniment to those photos than to feature one of new favorite canning cookbooks. Food in Jars by Marisa McClellan grew out of her wildly popular blog, Food in Jars. I just love to click onto Food in Jars, especially on those days that are not going so well. A brief click on oozing jams, bright jellies, and comfy conserves and I am a happy camper. Another of my favorite cooking techniques that Marisa employs is the slow cooker. I do love my slow cooker for apple butter and Maris shown a light on the multiple other butters one could make. This a favorite. Put the pureed blueberries in a 4-quart capacity slow cooker. Cover and turn it to low. After it has cooked for 1 hour, remove the lid and stir. From this point forward, you will want to keep the lid slightly cracked. Propping it open with a wooden spoon or chopstick allows for the evaporating steam to escape. This butter needs between 4 to 8 hours total in the slow cooker. The time varies depending on how hot you slow cooker cooks. Check the butter at least once and hour to check the progress. In the final hour add the sugar, lemon zest and juice, and spices. If you want to speed the evaporation, remove the lid and turn the cooker up to high. If you do this, make sure you check the butter every 10 minutes to prevent scorching. Once it is thick as ketchup and spreadable, determine whether you like chunky or smooth butter. Puree the butter for a smooth texture; for slight chunkiness, leave it as is. The great thing about this book is the range. From beginner to advance jam maker, there is something to get you into the kitchen. For those days you can't get into the kitchen, check out the blog! Either way you will find yourself very happy.